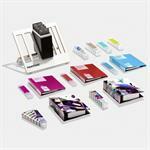 Includes 14 books and guides plus storage and display stand! 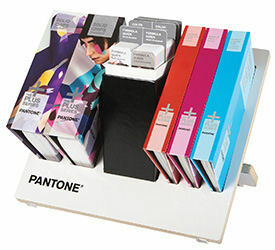 The PANTONE REFERENCE LIBRARY is a comprehensive collection of the most popular PANTONE Publications with more than 10,000 market-ready colors. It’s the perfect tool for agencies, in-house marketing departments, printers or schools. Now with 84 New Solid Colors to Let Your Creativity Shine! The set includes 644 new solid colors added since 2010 - with 84 colors added just this year - to FORMULA GUIDE, SOLID CHIPS, and COLOR BRIDGE. Save more than $900 over individual purchase! The set includes the full collection of the PANTONE PLUS SERIES fan guides and chips books – all of our spot colors, metallics, pastels, neons and process colors for print, packaging, web, video and other applications. Add an attractive and professional look to your creative workspace. Our new full-featured storage and display case keeps your guides and chips books organized, handy and beautifully displayed.